Tomato foliar diseases such as early blight, Septoria leaf blight, bacterial spot and speck that are commonly seen in the field are often less common on tomatoes grown in greenhouses and high tunnels. It is also true that high tunnel tomatoes have smoother skins than tomatoes grown in the fields. An important factor that determines this difference is rainfall. Pathogens that cause foliar diseases require leaves to be wet in order for infection to occur and rely on rain for spread. In addition, heavy rains cause tomato physiological disorders such as rain check. 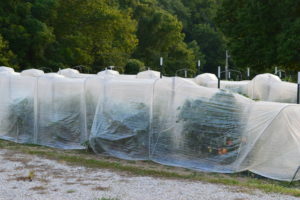 It is great that greenhouse and high tunnel structures prevent tomato canopies from direct exposure to rainfall, however, a significant initial investment is required for building the structures, and it is hard to relocate them after they are built. 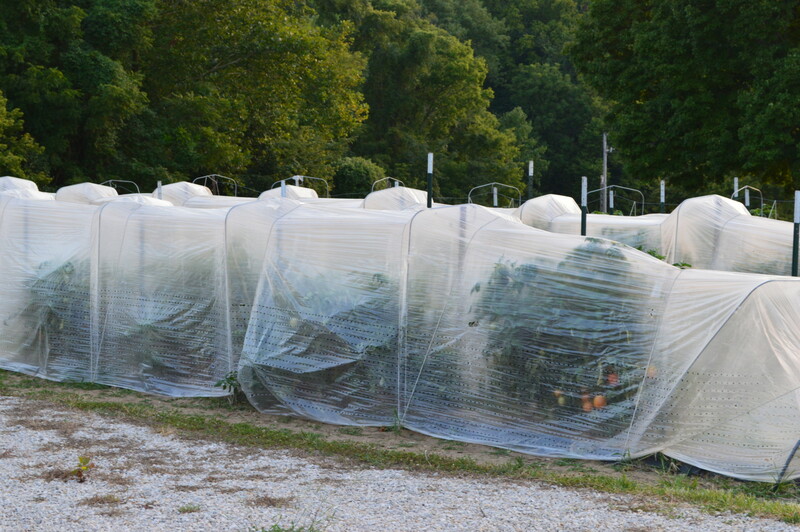 This summer, we used a retractable tunnel to grow tomatoes and peppers in the field (Figure 1). The tunnels are 5’ tall, covered with plastics that have perforated holes on the sides. Edges of the plastic are not buried into soils as most low tunnels do. Instead, the plastic can be pulled up or down on both sides. Hoops are placed 5’ apart and connected with tomato stakes. Elastic rubber bungees are used to keep the plastic on the hoops. Figure 1. Tomatoes are grown under a retractable tunnel system. We used the tunnels to grow tomatoes and peppers all season-long. The design is effective in keeping canopies dry when it rains if the sides are pulled down. When the sides are pulled all the way up, there are no clear differences in terms of temperature and relative humidity under the tunnels. Foliages of tomato plants grown under plastic seem to have less necrosis than those of plants exposed to the rains. But with a relatively dry season, we did not see a clear advantage of using the tunnels to improve crop condition. More years of observations are needed. Cost of the structures is about one-third of the cost of high tunnels. The structures are very easy to move. Except for the plastic, other parts of the structures can be used for many years. It should be noted that the retractable tunnels have little effects in enhancing temperatures in the early season. If you are interested in learning more about the retractable tunnel, please contact Wenjing Guan at guan40@purdue.edu.